WASHINGTON (Reuters) – Republican U.S. Senate Leader Bill Frist of Tennessee said on Wednesday he would not run for the White House in 2008 and will return to his medical practice after he leaves the U.S. Congress in January. Frist, a surgeon who served two terms, had been preparing for a possible presidential run for more than a year but said he decided this was not the time. “In the Bible, God tells us for everything there is a season, and for me, for now, this season of being an elected official has come to a close. 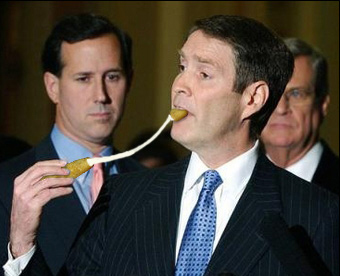 I do not intend to run for president in 2008,” Frist said in a statement. Frist had been criticized for his performance as Senate Republican leader and for the results of the congressional elections earlier this month. Republicans lost six Senate seats, relinquishing control of the chamber for the first time since 2002. Frist also was damaged by a federal probe into his stock sales, a critical drawback in a year when Republicans were hammered by voters over ethical issues. Frist easily won a straw poll of party activists in March at the Southern Republican Leadership Conference in Memphis, Tennessee, where he packed the home-state crowd with supporters wearing blue “Frist is my leader” buttons.